Burbank, California – On May 25, 2018, Burbank Police Headquarters dedicated a mural paying homage to Burbank Law Enforcement Officers who have been killed in the line of duty. The mural depicts Marshal Luther Colson, Deputy City Marshal Robert L. Normand, Officer Joseph R. Wilson, Officer Richard E. Kunkle, and Officer Matthew Pavelka. The mural portrays these fallen heroes in the dress, surroundings, and backdrop of the era in which each of them served. The mural is affixed to the wall just outside of the Patrol Briefing Room, a place where police officers start each shift. The artwork is a historically sobering reminder of the ultimate sacrifice these officers offered while protecting the citizens of Burbank. Burbank Police Sergeant Mark Stohl was the visionary who brought all of the necessary components together to make the mural a reality. He consulted with Jeanine Hattas Wilson of Hattas Public Murals, who completed the artwork and installed the mural with her team. 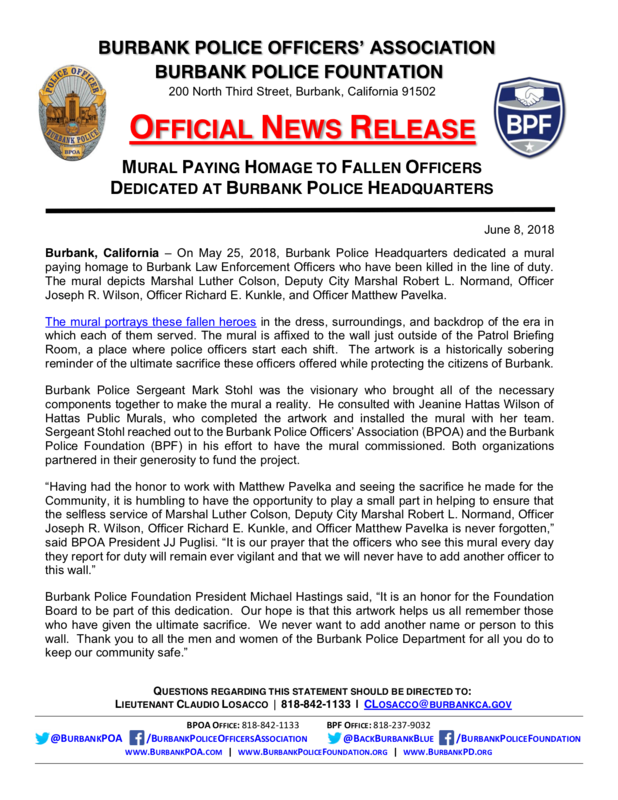 Sergeant Stohl reached out to the Burbank Police Officers’ Association (BPOA) and the Burbank Police Foundation (BPF) in his effort to have the mural commissioned. Both organizations partnered in their generosity to fund the project.